The high-end GD sensing technology detects double feeds of any metal sheet 0.01 mm 0.0004 in, or more, thick. Optimum sensitivity setting is easy by using the teaching function with actual samples. 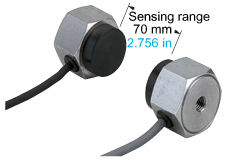 This is an extremely small sensor head, only ø3.8 x 15 mm ø0.150 x 0.591 in, suitable for detecting small components. It is suitable for high precision detection of double feeds of lead frames or thin metal sheets. It achieves a long sensing range of 70 mm 2.756 in. Further, it employs a robust metal case with IP67 protection to withstand harsh environment. 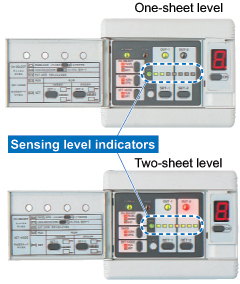 The optimum sensing point can be confirmed at a glance as seven LEDs indicate the sensing level. Since sensitivities of eight channels can be stored, product changeover is smooth and easy. 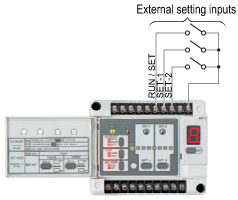 Select channel number by the "Channel shift key" on the operation panel or by using external channel select inputs. 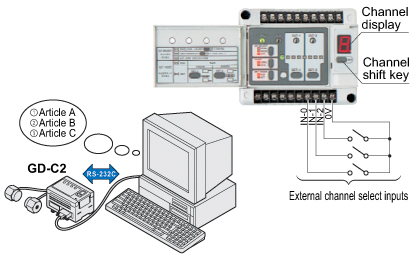 Further, since GD-C2 is equipped with RS-232C communication function, the sensitivity values can be stored in a personal computer, etc., and fed into the controller as per requirement. 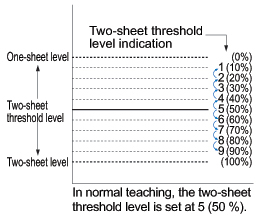 The two-sheet threshold level set by teaching can be shifted in nine steps to suit the detection conditions. This enables very stable detection. Teaching is possible by external devices, such as, PLC, etc. This enhances productivity by machine automation.